By Peter Anderson 14 Comments - The content of this website often contains affiliate links and I may be compensated if you buy through those links (at no cost to you!). Learn more about how we make money. Last edited January 4, 2013 . In his book, The Millionaire Next Door, Thomas J. Stanley explains how his research has found that individuals who have attained a high net worth have quite a few things in common. In particular, they were found to have these 7 basic attributes in common. According to Stanley, if you can emulate them, you too can become wealthy. They live well below their means: They may make a large income, but they don't live like it. They are, as Stanley says, “Frugal, Frugal, Frugal”. They live in an older house, drive an older car and don't spend a lot of money on life's luxuries (often because they don't enjoy them). At an interview they did of millionaires, one deca-millionaire when asked if he would like an expensive glass of wine responded that he drinks only two things, scotch and two kinds of beer – Bud and Free. For those wealthy that were married, they almost always found that the spouses were also frugal. If one spouse is a hyper-consumer, it is extremely difficult to end up with a high net worth. They allocate their time, money and energy efficiently in ways conducive to building wealth: Wealth accumulators spend more of their time in doing things that are conducive to creating wealth – budgeting, planning and setting goals for their future. They work hard towards their goals, and are more likely to be spending time planning their goals. Those who are high income earners but that do not have a high net worth do not spend as much time in these activities. In fact they found that PAWs (prodigious accumulators of wealth) spent almost twice as much time every month in planning their investments as did UAWs (underachieving accumulators of wealth). They believe that financial independence is more important than displaying high social status: They don't care about living in the right neighborhood, having a big house, driving the newest cars or shopping at the trendiest stores. These high net worth individuals care more about providing for their own financial independence and work towards that goal. Their parents did not provide economic outpatient care: The parents of these high net worth individuals did not subsidize their lifestyle, or give them a bunch of money. They made their own way, working hard and succeeding on their own terms. Children who receive economic outpatient care (EOC) often are stripped of their motivation to work hard and achieve, and as a result often do not become PAWs. Their adult children are economically self sufficient: The children of high net worth individuals have been taught how to live a frugal lifestyle, how to accumulate wealth, and often have been taught how to succeed on their own without help from their parents. Because they don't receive EOC, and in general are self-sufficient, it allows their parents to accumulate more and be better off later on. They are proficient in targeting market opportunities: The high net worth are good at seeing opportunities and taking advantage of them. They aren't immune to the fear of failing that all of us have at times, but they overcome their fear and act upon good opportunities when they see them. They chose the right occupation: Those who have a high net worth almost always are doing something that they enjoy – and they work hard at their chosen career. Just because you're not an entrepreneur or a business owner doesn't mean you can't be wealthy. You just have to choose a career that will provide a reasonably decent income, and live in a way that is conducive to building wealth. Find a career that you enjoy, work hard at it, and live frugally – and you can build a large net worth. 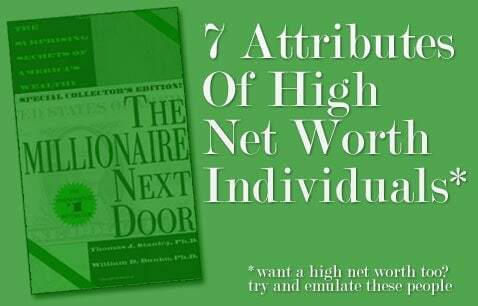 These 7 attributes of high net worth individuals really expose the framework for living a life based on sound financial principles. The attributes prove that it is possible to live well on much less than you make, and have plenty left over to save, invest and give. It can even be done by individuals who don't make a lot of money, as long as they are disciplined. The attributes speak to the power of educating yourself and your children about money, and practicing sound money management through the use of budgets and financial plans. They show that displaying high social status often means that you won't be financially secure. (That's funny in a way, isn't it?). The attributes show how money is a tool to be used, and should not be an end in itself. Those who understand that are often happier, and in the long run, wealthier. What do you think of these 7 attributes of high net worth individuals? Do you find that they make sense to you, and are you practicing the things that they reveal? Are there areas where your values aren't lining up with those of these high net worth individuals? Let us know what you think in the comments! Last Edited: 4th January 2013 The content of biblemoneymatters.com is for general information purposes only and does not constitute professional advice. Visitors to biblemoneymatters.com should not act upon the content or information without first seeking appropriate professional advice. In accordance with the latest FTC guidelines, we declare that we have a financial relationship with every company mentioned on this site. I think it is interesting that the point is made about net worth. I was surprised to find that many of the people I thought of as “rich” growing up really don’t have wealth in terms of net worth. Home equity loans and other debt have financed a certain lifestyle, and even though they make six figures, they always seem to need more money. Just because you make a lot of money doesn’t mean you are wealthy. That was one of the big things I took away from this book. A rich lifestyle and a need to display social status – and accumulate “things” often leads to a low or negative net worth. When you see money as a tool to be used for other goals, instead of an end in itself you’ll end up being a lot more successful. Its very easy to fall into the social status trap. It’s a battle to fight that in our culture all the time. I’ve seen many cases of parents bailing out their adult children time and again leaving the parents to figure out how they will afford retirement. I’m not in that situation and I’m sure its tough when you see your own kids struggling to make ends meet. I wonder how I would respond to that situation. I had read this book a few years ago. This post is a great reminder of the seven attributes. I like the point on time, money and energy allocation. Setting financial goals, spending time budgeting and tracking income to make sure you’re in-line with goals is key to building wealth and making progress towards financial objectives. It doesn’t require much time each day to track income and review it against a spending plan. Nor does it take much time to review and revise a spending plan at the beginning of each month. The ROI for these tasks is monumental when it comes to getting out of debt and building a solid financial future. Never read the book, but I love hearing the fact (and seeing supporting stats) that most wealthy individuals make it on their own. VERY inspiring. My Journey´s last blog ..A simple Tax Forward Turns into an E-Mail Battle! Having read the book and also having worked with a few self made millionaires in my career, the attributes listed are right on the money, the only exception perhaps being #5 about their kids being economically self-sufficient. Not always the case. It seems the millionaire mindset isn’t entirely genetic. Or that even though the parents might model millionaire behavior, their children don’t always respond to it in a constructive way. #1 is always key to me. I have struggled this week with the decision to pay $2K to get my 11 year-old, 157K miles car fixed. I can easily afford to upgrade but would cost more. Although the car would be nicer to look at, I’m more worried about meeting other financial goals and living under my means for a better future. Well, if the career that you enjoy and work hard at happens to be something like Art, then it’s very unlikely you’ll have ‘reasonably decent income’. Sometimes the job/career you LIKE and the one that actually pays a LIVING WAGE are in complete odds with each other. In His Word God tells us to manage our money wisely. Management requires time spent setting and achieving goals. In the famous parable of the talents (Matthew chapter 25) Christ tells us that he servant who buried his talents in hopes that they would grow did not multiply them and actually had them stripped away. It was the two servants to spent time managing their talents who were blessed of God. Matt Jabs´s last post ..Credit Cards – Close ‘em Shred ‘em & Forget ‘em! BD, I am completely debt-free (incl. the house), above the average (and way above the median) net worth for my age and income – and I am a high school teacher. It can be done. Yes, you have to earn a decent amount of money, but it is what you keep that really matters. The book that influenced me the most was not the MND, but Your Money or Your Life (by Vicky Robin and the late Joe Dominguez). Their basic premise is to find the amount of money that is “enough” for you; once you find that and live on that amount, you are content. What more can we ask for? I like the point that they did have to take some calculated risks. I took one about a year and a half ago, which included purchasing my first rental property with a business partner. Of course, the risks have to be balanced out with all the other Biblical principles, especially that of being debt free. That is the area I am now working on, along with giving the full amount of the tithe. I love the millionaire next door. The followup, “The Millionaire Mind” is also a great read too. I’m currently reading the millionaire mind. Expect a post on that one soon! Next Post: Debt Free Story: How Frugality, Hard Work And Determination Can Lead To Debt Freedom.